Stainless steel latches are especially useful for industrial, construction and agricultural latches. 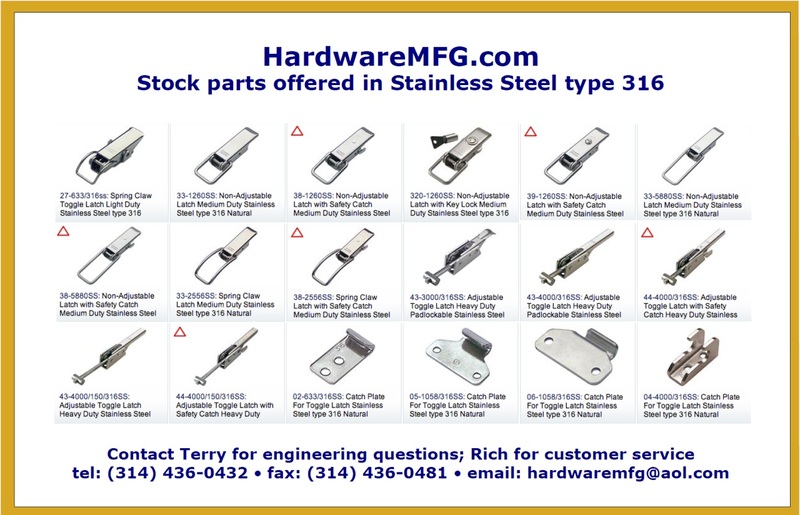 Stainless Steel Latches – Hardware Mfg. Stainless steel latches are durable, long lasting and corrosion resistant latching options for applications requiring secure closure. Typically, heavy duty latches receive tremendous wear due to high frequency or high stress use. They require the additional strength and security stainless steel latches offer. Applications such as doors, gates, construction and agricultural latches are often fabricated from stainless steel. Gate latches, for example, are used with great frequency and so are required to be durable enough to withstand wear and tear. Additionally, most gate latches are outdoors and exposed to the weather. Other types of latches typically fabricated from stainless steel include paddle latches, spring latches, compression latches and more. Stainless steel is naturally a corrosion resistant material, making its use ideal in components of outdoor hardware and in applications such as marine or nautical which are exposed to moisture. The lightweight durability of stainless steel lends itself to the many steps involved in latch manufacturing. Although stainless steel products are sometimes more expensive than plain steel, the resilience of stainless steel means latches made from it tend to last longer and prove to be a less expensive long term choice. The micro-structure of stainless steel allows it to withstand elevated and below freezing temperatures as well, rendering it heat and fire resistant. Stainless steel is easily cleaned and is able to be used for sanitary operations as it can be sterilized without the materials and physical properties breaking down. This attribute, in addition to its tolerance for hot and cold temperatures, makes stainless steel latches integral to most hospital, kitchen and food preparation areas. Examples of latches used in these environments include cabinet latches, refrigeration latches, and utility box latches. The properties of stainless steel suit virtually every type of latch. An important quality of stainless steel is that it is significantly stronger than conventional steel grades and therefore material thickness is reduced while still maintaining strength. This attribute can cut costs for latch manufacturing as less material is required in the overall fabrication process. The intricate designs of many types of latches necessitate a material that can be cut, stamped, welded, die cast or any combination of those processes to achieve the final product. Stainless Steel Latches Stainless steel latches offer a very durable type of mechanical fastener that secures two ordinarily separated surfaces.